“Generous,” “innovative,” “engaging,” “refreshing,” “dedicated”: These are just some of the words students used to describe this year’s winners of Yale College teaching prizes. 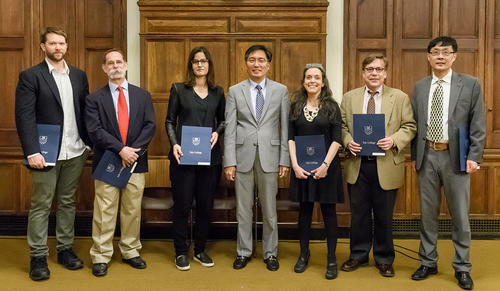 The six winners of the university’s top prizes recognizing undergraduate teaching excellence were honored in a ceremony on May 7 in Sterling Memorial Library attended by many of the students who nominated the faculty members, along with some of their colleagues. This year’s winners are Joanne Freeman, Andrew Ehrgood, Timothy Newhouse, Harrison Huibin Zhou, Rosie Bsheer, and Kurt Zilm. Yale College Dean Marvin Chun presented the annual awards. Calling Yale “the research institution most dedicated to teaching and learning,” he explained that what makes this university special is that its faculty members are both distinguished scholars in their fields and highly dedicated teachers who make classroom learning a top priority. Chun noted that the teachers were chosen for the awards based on the recommendations of students, who applauded and cheered as their teachers were presented the awards by Chun. Joanne Freeman, professor of history and of American studies, your students have praised you over the years for bringing “the past to life,” and for your dedication to teaching, both in and out of the classroom. They say again and again how generous you are with your time and advice, and in particular how their writing has improved under your guidance. Your students love your stories as much as they love your teaching style. For your enthusiasm and devotion to teaching, Yale College proudly awards the Sidonie Miskimin Clauss ’75 Prize for Teaching Excellence in the Humanities to you, Joanne Freeman. Rosie Bsheer, assistant professor of history, your students praise your “ferociously extensive knowledge” and are grateful for the “desire for knowledge” that they have after taking your courses. From your teaching in an “exceedingly popular and coveted” first-year seminar, “Oil and Empire,” to your advanced courses on Middle East History, you have a “reputation for encouraging students to strive for rigorous and careful thought.” Students who have taken your first-year seminar feel as though you’re giving them a foundation for their future terms at Yale with your expectations and assignments. For these reasons, Yale College proudly bestows the Sarai Ribicoff ‘75 Award for the Encouragement of Teaching to you, Rosie Bsheer.